There's some serious trouble brewing within the ranks of the Saviors. On The Walking Dead Season 8 Episode 5, we followed the lives of Negan and the Saviors before, during and after Rick's initial attack on the Sanctuary. While the first four episodes of the season were heavy on action, "The Big Scary U" took a significantly dialed back approach. But that didn't mean nothing fun or exciting happened during the hour. The meeting between Negan and his lieutenants with Gregory before Rick's attack made for an engrossing conversation. Simon was totally oblivious to how little pull Gregory actually had at the Hilltop, now that Maggie is the de facto leader. Things got uncomfortable quickly when Simon exerted his authority with the suggestion of killing everyone at the Hilltop should they refuse to stand down. Naturally, that didn't sit too well with the boss. We know that Simon is Negan's right-hand guy, yet this is the first time that we've seen these two on shaky ground. 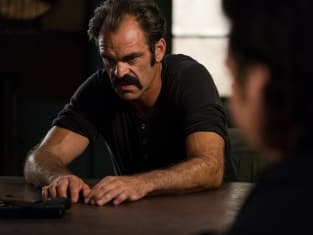 Not only was Negan unhappy with Simon forgetting his place, but the idea of threatening to wipe out an entire community would not work in the Savior's benefit. The more communities that Negan has working for him, the better. Although. The Kingdom itself was essentially wiped out on The Walking Dead Season 8 Episode 4, which is the opposite of what Negan is trying to establish. As much as Negan gets joy out of killing, he's more about making an example of people and using fear to get what he wants, i.e., Glenn and Abraham. 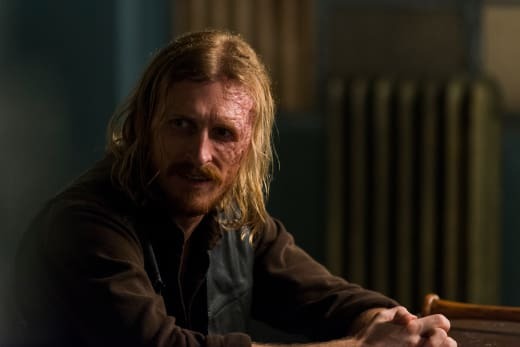 While trapped in the Sanctuary after Alexandria's attack, Simon used the opportunity in an attempt to reveal the leak within the Saviors. Dwight did a good job deflecting and shifting the focus to working on a plan to get out of the Sanctuary. However, now Simon appears to be convinced that Eugene is the mole, which would be the obvious choice if I were in Simon's shoes. Eugene is the only person originally aligned with Rick before being taken in by the Saviors, so if anyone would be a prime suspect, it's Eugene. 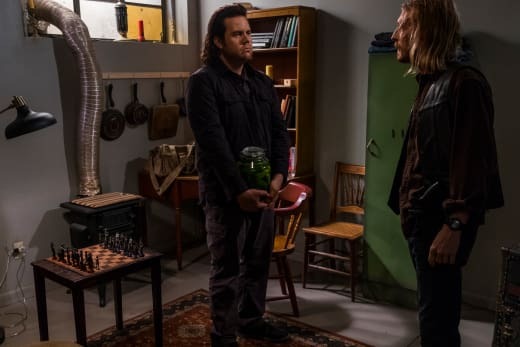 Eugene now knows Dwight is the mole after noticing the same red paint from Dwight's freshly painted chess pieces were in the bag of guns taken from the armory. It didn't take much to put two and two together -- Eugene is an excellent observer. Does this mean Eugene will rat Dwight out? Not likely. In fact, I wouldn't be surprised in the least if Dwight and Eugene work together and set up Simon as the mole. 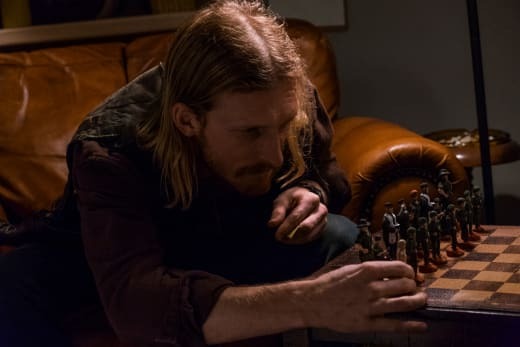 Simon appears to already be on thin ice with Negan as it is, so it would be a great opportunity for Dwight to use that situation to his advantage. The best way to get rid of the speculation, is to outright pin it on someone else -- and who better to try and pin it on than Negan's right-hand man? The best part of the episode was Negan and Father Gabriel's interaction while holed up in the trailer. I was extremely surprised by Negan's behavior while shooting the breeze with one of the guys that just attacked his home. Negan engaging Gabriel and seeing the banter between the two made for some great moments. It's not like they were going anywhere, so it was the perfect time for them to get acquainted with each other. 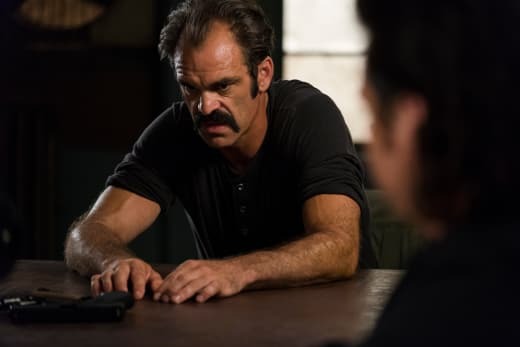 Gabriel felt his purpose for being there was to take Negan's confession, and while Negan was incredibly reluctant to confess anything, he eventually caved. What I found amusing was how Gabriel called Negan out on all of his BS. And I highly doubt Negan has ever had anyone talk to him in that way without getting their head bashed in. Once Negan realized the likelihood that he may not make it out of there alive, he began to drop some juicy little nuggets about his past. I'm glad that The Walking Dead is finally beginning to peel back those layers and attempt to humanize Negan a bit. 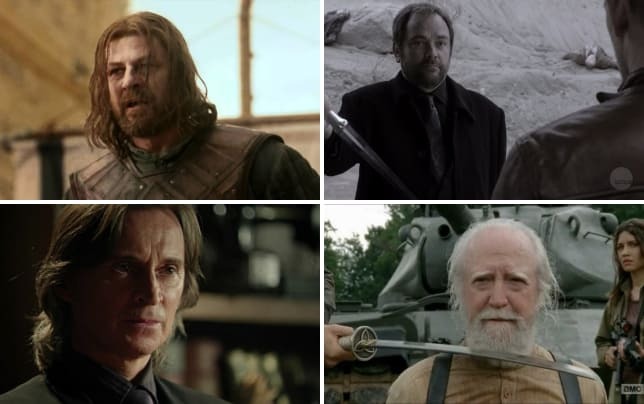 It's something the character has been seriously lacking when compared to past villains such as The Governor. 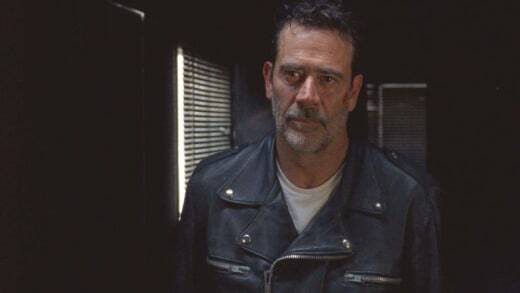 And although we only scratched the surface, it was great to see Negan at is most vulnerable. We learned that before the apocalypse, Negan worked with children. That's a horrifying career choice for a guy who now enjoys the beating brains in of people who don't abide by his rules. That's not exactly the type of person I'd want caring for my son. Negan also had a wife whom he fooled around on and later discovered was terminally ill. I found it interesting that he held up his bat while talking about his wife, asking Lucille for strength. What I took from that moment is that he was talking at his Louisville Slugger, but he was talking to Lucille. That suggests Lucille was the name of his late wife. It would make sense why the name he had given to his weapon of choice has such significant meaning to him. Hey, the Governor kept his walker daughter in a closet only occasionally taking her out to comb her hair. Who am I to judge? Father Gabriel taking advantage of Negan's moment of weakness and grabbing his gun was very surprising. It was very unlike his character to try and make such a bold move. Yet, Gabriel has grown a serious pair of cahones since he first met Rick on The Walking Dead Season 5 Episode 2. As much as he's grown though, he's still a terrible shot. It was fun watching Negan and Gabriel use the walker camouflage and make it back to the Sanctuary. My only real gripe with the episode was how the horde seemingly overran Negan and Gabriel, yet a few moments later they showed up at the Sanctuary. It just didn't make any sense, and it felt as if a scene or two remained on the cutting room floor after the editing process. Go back and watch the scene again of Negan and Gabriel surrounded by walkers. There was no logical way out of that scenario. I suppose sometimes logic just needs to go out the window in certain cases. Unfortunately, Gabriel did get bit at some point during their escape since he was in pretty bad shape when Eugene went to check on him. As disappointed as I am in knowing that Gabriel's time is up (his death has been hinted at since The Walking Dead Season 7), his flashback at the church sealed his fate. The Walking Dead's trend of background characters getting killed after receiving important focus in an episode is the norm these days. 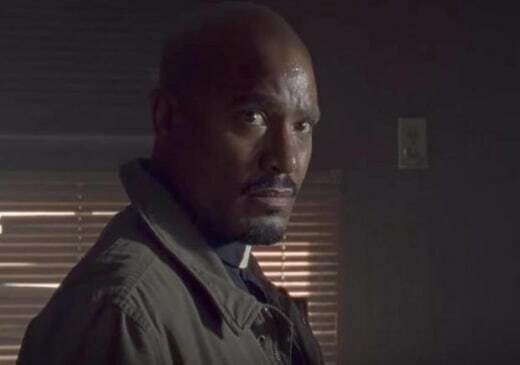 So it shouldn't be much of a surprise that Seth Gilliam's tenure on the show is coming to an end. The Rick and Daryl brawl didn't add anything other than using it as a cheap plot device to destroy the big guns and take them out of the picture. We know Daryl wants to take the Saviors down at all costs, but it didn't need to culminate with Rick and Daryl trading blows. Do we need to see the two men throw down? All that work and nothing to show for it except for some new cuts and bruises. Gabriel and Negan talking through the door in the trailer was brilliant. The way the whole scene was set up as if they were in a confessional was very well done. Negan punching Gabriel in the face after his sins were forgiven was pure gold. I'm glad the show finally addressed Maggie not having a primary care physician during her pregnancy. Will Eugene help Gabriel get Dr. Carson back to the hilltop? It was strange to see Negan so vulnerable as he talked about his late wife, but seeing those emotions on full display while giving us a brief glimpse into his past was terrific. Who was that guy spying on Rick? He might have been one of the Scavengers from Jadis' group, but I'm not quite sure. Where did that helicopter come from, where was it heading and who was in it!?!?!? Now it's your turn TV Fanatics! What did you think of "The Big Scary U"? Did you enjoy getting a glimpse into Negan's past? Do you think Simon will end up being set up as the mole within the Saviors? Hit the comments below and let me know! You can always watch The Walking Dead online right here at TV Fanatic! 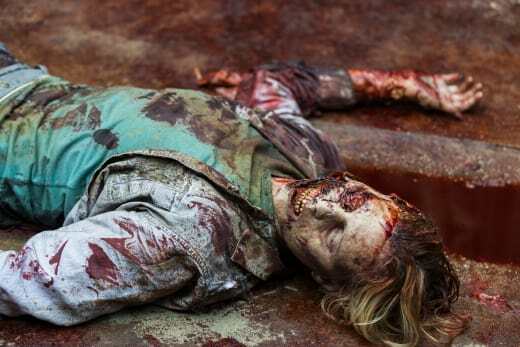 The Walking Dead returns with a new episode on Sunday, November 26.